Ricardo Soares specializes in Meditation, Mindfulness, Breath-work and and the Physical Techniques and Methodology know as the Derose Method. 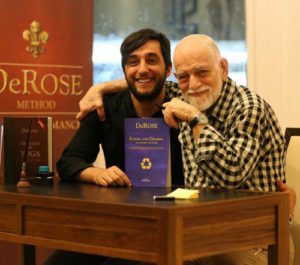 The DeRose Method is a comprehensive methodology to achieve high performance in life. To teach this methodology they use a system of physical techniques and concepts to empower their attitudes and mental states. As a Teacher and founder of the DeRose Method TriBeCa, Ricardo moved from Portugal to New York City to share his knowledge and practice in one of the most vibrant cities in the world. His focus lies in entrepreneurship, conflict management, relationships and overcoming limits as a path to self-knowledge! Ricardo has been working with the DeRose TriBeCa methodology for the last 15 years and helping clients that need to be functioning at peak performance levels. His students include olympic athletes, professional race car drivers, CEOs, and leaders from around the world.